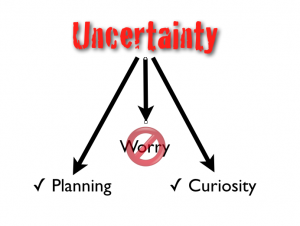 Uncertainty is widely accepted by performance experts as one of the most common factors contributing to stress. The irony is that everything in life is uncertain, except for “death and taxes” (according to Ben Franklin). Whether you are an athlete preparing for the Olympics, a business person attempting to land a major account, a surgeon preparing to operate, or a young lover contemplating a lifelong commitment — you can feel confident; but there are no guarantees. Not knowing is a part of life. The attitude and emotion that you bring to the unknown has a major influence on how you perform under pressure. 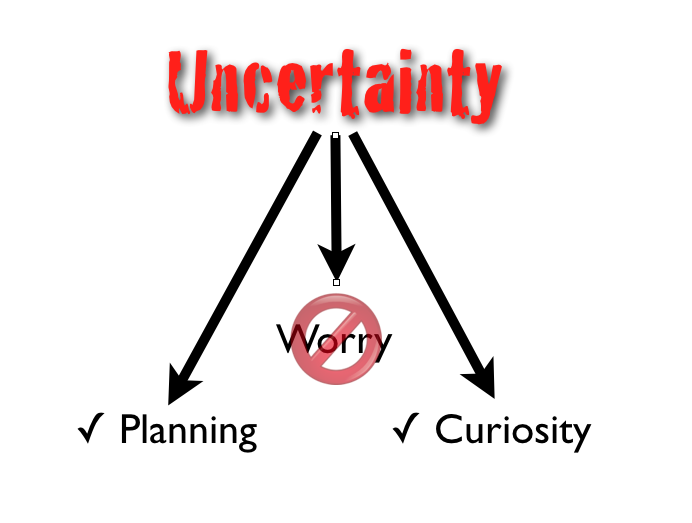 Consider the emotions driving the three primary paths through uncertainty: worry, planning and curiosity. Worry is fueled by fear. It is a succubus to the energy that is required for excellence, and will drain a person of creativity and confidence in dealing with uncertainty. Worry is a waste. By contrast, if you take the same uncertainty and wrap yourself in cool, dispassionate logic, you can enter the realm of planning. You never know exactly what will happen; but you probably have an idea of situations that would be challenging. For each situation, decide in advance how you ideally want to respond; then practice that response either by mentally rehearsing your deftly dealing with the distraction, or actually seek out opportunities to practice in real life. For example, the upcoming US Olympic Team Trials for swimming will be held in a venue rarely experienced by swimmers. The competition pool has been constructed in the center of the CenturyLink Center, an arena in Omaha that is complete with jumbo-tron scoreboards, spotlights and poolside pyrotechnics whenever a world record is broken. 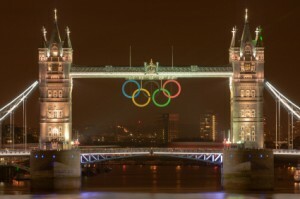 The swimmers with whom I work have been mentally rehearsing being on center stage, refocusing after fireworks, and preparing for the “long walk” rather than the more familiar short trek from the ready room to the swimming blocks. A business person may mentally rehearse dealing with a less than cooperative audience, and even recruit colleagues to role play the scenario in a practice situation. 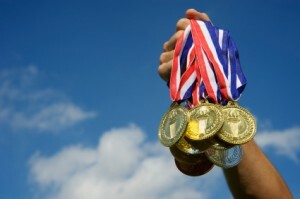 Research has shown that mentally preparing for adversity and distractions improves confidence and performance. 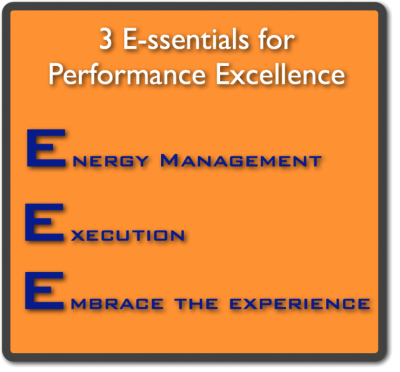 Great performers typically are great planners. Where worry is fueled by fear, and planning is more dispassionate logic, curiosity has the potential to tap the delightful emotions of anticipation and wonder. Remember what it was like to see a present wrapped with pretty paper and a bow, not knowing what was inside, but excited with all the possibilities? At some point in time, your anticipated moment of performance will be your present. There is a fine yet powerful distinction between worrying how you will perform and wondering how you will perform, fueled by the optimism of curiosity. Take a moment for this little experiment: Think of an upcoming performance situation, and now start worrying about it. (okay now, don’t just read this; I want you to actually experience this exercise). Study the muscle tension in your face and brow as you engage in worry. Now take the same upcoming situation, and mindfully think of it with curiosity. Study again the muscle tensions in your face and brow. For most people, there are marked differences between the furrowed brow of worry and the wide-eyed wonder of curiosity. If you want to replace worry with curiosity, use these physical cues to help develop the habit of curiosity. It begins with mindfulness. Periodically check out the muscles in your face when thinking of performance situations. If you discover any tension that is associated with worry, pause, breathe, and gently raise your brow while wondering about the event in a non-judgmental, inquisitive manner. Enjoy the unknown and all the possibilities the future might bring. Once you master this sequence, practice, practice, practice! Curiosity didn’t kill the cat; worry killed the cat. Planning helped the cat deal with distractions, and curiosity helped it enjoy the journey.